Description Original signed , dated,Watercolour on Heavy Paper; Approximately 10" x 14"
Brief History An early theme, originally drawn in 1863 for the book by Rev.T.Jackson, re-engraved in 1867 for The Harpers Weekly. Re-engraved a third time for The Animal World, June 1902. Finally,an original watercolour, also from 1902, spanning a period of 39 years from first to last. Original Watercolour by Harrison Weir, signed and dated 1902, when the artist was 78 years old. This original water-colour study by Harrison Weir, is signed and dated 1902. It came to auction in 2012 and was purchased for the Harrison Weir Collection, having clearly been once framed and with the original paper somewhat aged and darkened. But the image itself has an intriguing history, as it is not often that a subject by an artist is repeated over so long a period, in this case, beginning in 1863 and finishing in 1902, a span of 39 years. 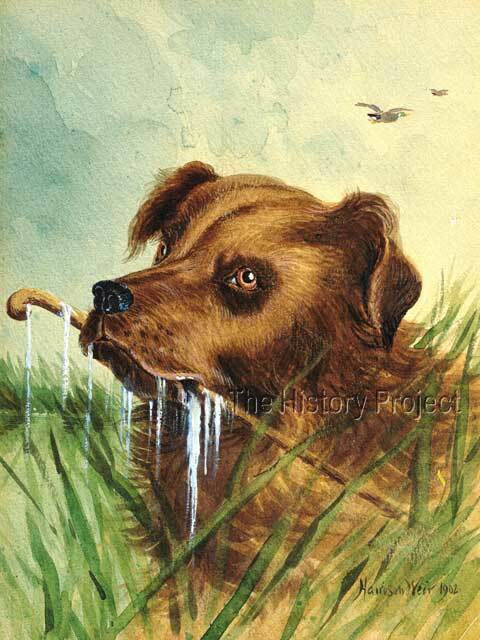 The image first appeared in the publication 'Our Dumb Companions' a children's book written by the Reverend Thomas Jackson, who was also the author of 'Our Dumb Neighbours', and the better known 'Anecdotes in Natural History' and 'Our Feathered Companions'. All of these books featured the artwork of Harrison Weir, but not exclusively so, as works were also included by Sir Edwin Landseer, Rosa Bon Heur, J.B. Zwecker and W.H.Freeman. However it is fair to say that in this title, a clear majority of the drawings were indeed by Harrison Weir. The books were generally based around 'conversations' between a father and his children, discussing animal related questions, as a method of introducing natural history as a subject to children. All of the books are written, based on this strategy. Two of the books are dedicated to The Earl of Harrowby, who was at that time, was the President of the Royal Society for the Prevention of Cruelty to Animals. A number of reprinted editions of this work were produced, from the 1860's up until the late 1890's, all with different cover designs. 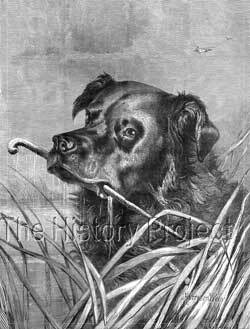 In the first instance, the engraving is entitled 'The dog that ran away with the brushes', although in the image, it is clearly a dog retrieving a walking stick! So the drawing, intended to illustrate another anecdote altogether, was a poor fit for anecdote with which it was used. This version of the image is the earliest found, and dates from 1863. 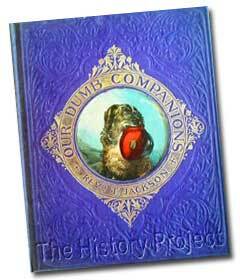 Above left: Version 1, 'The Dog than ran away with the brushes', from Our Dumb Companions by Rev. T. Jackson, (1863). 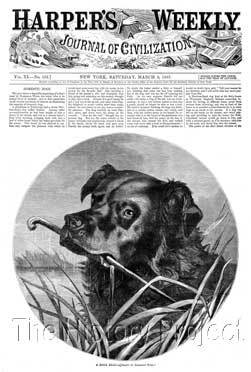 Four years later, in 1867, we find the theme of the dog fetching the stick from the river, repeated in a second engraving, this time used in a large format, on the cover page of Harper's Weekly, which was published in New York. 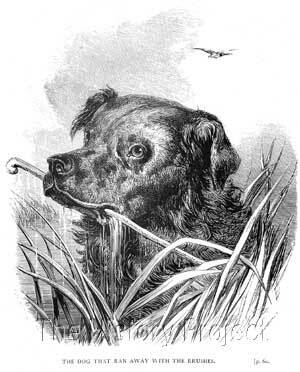 The issue is dated Saturday 9th March and in this instance, the caption reads, 'A Dog's Head' (drawn by Harrison Weir). This would suggest that this same image is likely to have been firstly produced in London and probably published in this format in The Illustrated London News or 'The Graphic', as it was not uncommon for plates from these London newspapers to find their way across the Atlantic and be subsequently republished in Harpers Weekly. We then jump to 1902, where, in the June edition of 'The Animal World' an excellent new full page engraving has been rendered upon the same theme. We must presume that Weir may have been called upon to re-draw the image in order to reproduce it in its enlarged and more detailed format. 'The Animal World' was a monthly 'advocate for humanity' published by S.W.Partridge & Co on behalf of The Royal Society for the Prevention of Cruelty to Animals. Weir's work was often published in it and some of his greatest large full page plates are from its pages. In this case, the June 1902 edition, carried the new image entitled 'The Queen's Favourite'. Then lastly, we have no way of knowing when in 1902 this original watercolour was produced, but by this time, Weir was 78 years old. He was still actively drawing, painting and writing. To have this piece which dates from around the time when he was putting the final touches to his magnum opus, 'The Poultry Book' is indeed astounding. Whether he did it at the request of a friend or acquaintance, or for pleasure, or as a gift, we will probably never know, but we are pleased that it found its way into our collection, where it can be truly appreciated for what it is, a rare and valuable part of his personal history.